Thy Primordial (1994-2005) is a Black Metal band from Mjölby, Sweden. hy Primordial formed in 1994 and without wasting a second their debut demo was released in 1995 entitled De Morka Makters Alla, and a one album contract with US based 'Gothic Records' followed. The resulting effort, Under Iskall Trollmane (1996), would end off being delayed until 1998 (as a complete surprise to the band and their new label that caused the delay in their eventual third album to avoid marketplace confusion) so the act marched on with a new demo later that same year, a tape that remained untitled but lead to a more lasting deal with 'Pulverised Records' and the demo material appeared as a 7" soon after. 'Pulverised' were attracted to the band based on the effort of their Svart Gryning demo of earlier that year. Influenced by Dissection, Marduk, Dark Funeral, Inbattle, Dismember, and the like, in 1997 their Where Only The Seasons Mark The Paths Of Time would showcase the band's belligerent old-school black metal. The album was not just a landmark for Thy Primordial but the industry as well for it would become the first non-major release to benefit from the 20 bit recording technology that was now available. Their third effort's release was delayed due to the aforementioned arrival of the debut recorded two years previous, but At The World Of Untrodden Wonder would eventually emerge in 1998 with an 18-page booklet, clearer vocals and their debut T-Shirt. The follow-up album, The Heresy Of An Age Of Reason (1999) took only 5 weeks to complete the 8 tracks but within a year rumors were abound that 'Pulverised's' three album contract with the band was now fulfilled and Thy Primordial, clad in spikes, paint and leather, and featuring the membership of J. Albrektsson (bass), Mikael Andersson (guitar), Isidor (vocals), N. Nilsson (guitar) and Morth (Real Name: Jocke Pattersson; drums), were seeking a new home, even asking Canada's 'Emperor Multimedia' for interest. 'Emperor' took them seriously but not signed as 'Emperor' was, back then, a struggling start-up itself. Thy Primordial was also facing their first membership change with N. Nilsson choosing to leave. After signing to 'Blackend/PHD' (UK) their new album, The Crowning Carnage was released in March of 2002. Isidor would be the next member to leave. Nicke Holstenson (ex-Nominon) was selected to take his place for 2003's Pestilence upon Mankind. 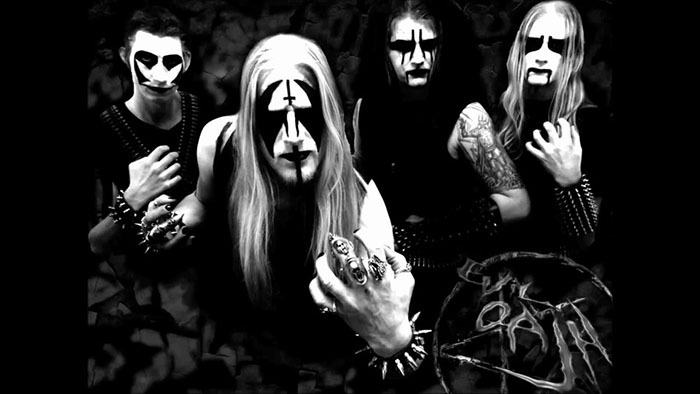 Morth, for his part, had drummed for Unmoored on the side during the sessions for their Kingdoms Of Greed album, and added production credits with their previous Cimmerian opus. Two years later, Thy Primordial called it quits. Footnote: during the life of Thy Primordial several members engaged in a side project with members of Mithotyn called Indungeon. FYI: Emperor Multimedia was the former owner of this website - Diskery.